One of the supposed surprises of today’s Obamacare ruling is that Anthony Kennedy, the traditional swing vote on the court, joined the fire-breathing conservatives in their bid to wipe out ACA completely. Meanwhile, reliable conservative John Roberts shied away from the precipice and wrote a modest, Kennedy-esque opinion that split the baby but ended up mostly leaving ACA intact. I’m not sure why Roberts chose to do that, but Kennedy’s vote was less of a surprise: some time ago, for reasons that remain mysterious, Kennedy seemed to finally tire of being the court’s perennial squish. Who knows why? Maybe he just got tired of being called a squish. In any case, over the past five years he’s steadily become a much more reliable conservative vote, something the chart below, which we ran a couple of days ago, confirms. 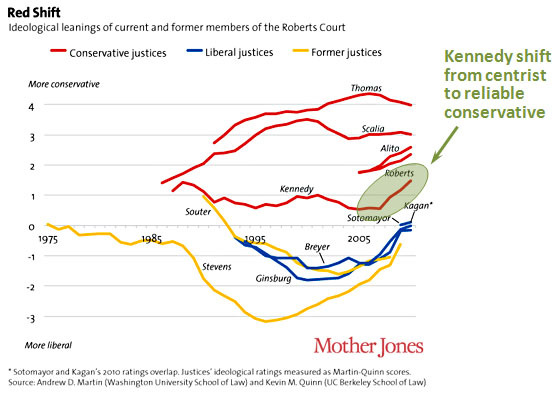 As you can see, several of the justices have moved rightward over the past few years, but Kennedy is the only one who’s moved from the center to a firmly conservative position, and he shows no signs of stopping. Whatever the reason for this, it’s really not correct to think of Kennedy as a centrist anymore. He’s now a pretty firm conservative vote, and Citizens United and the Obamacare decision have been his coming out party. The days of Lawrence and Kelo are long gone.